Amy Rowbottom of Crooked Face Creamery. NORRIDGEWOCK - For many, hometowns are just that- a place you know as a kid before growing up, leaving for some adventure or another and visiting on the occasional holiday. Or a separate place altogether where you settle to start your own history. But for some, the word is both. A place you grew up, and a place where you restart your own story. Amy Rowbottom never predicted she would return to her family's farm as an adult, with a daughter and a story to begin. "My life hasn't been the straight arrow I thought it would be," she said. Rowbottom was an English major in college, going on to try her hand in journalism then web design and marketing. She moved from apartment to apartment, working with computers, in the political news world and living the city life. "But every time I moved to a new apartment, or a new city, I felt the pull back here. I missed the farm," she said. "The farm" is her parents' 200 care, 70-holstein milking farm in Norridgewock that they bought for $60,000 in the late 1960s. A place where she and her siblings spent their days playing outside, along the Kennebec River, helping her parents hay the fields in the summertime. "It was an amazing way to grow up. When I started thinking of kids I knew this was the lifestyle I wanted for them," Rowbottom said. "Our parents never pressured us to take over the farm. But they love that I'm here." 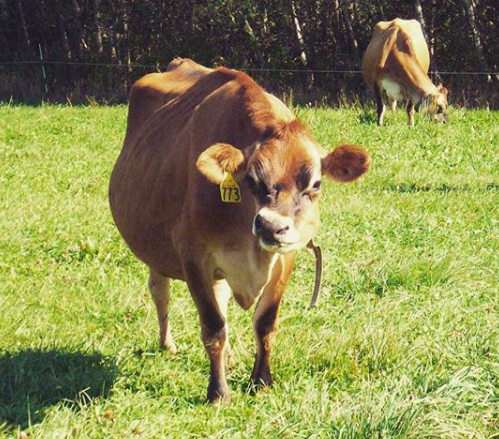 Rowbottom hasn't continued her parents' milking business, although she works with fresh Maine Jersey milk almost every day- and the cute face of a smiling cow appears on every round of cheese sold by Crooked Face Creamery. The iconic grinning cow arrived on the scene in 2010, when Rowbottom became an officially licensed business. In seven years she's accomplished a lot, from her first Farmington Farmer's Market to her signature cold smoked ricotta. "I put a batch in the cold smoker for an hour before trying it. It was like the skies parted and the sun shone down on me...it was special," she said. She began to focus on her unique ricotta, a product that wasn't being offered anywhere else in the state. Now Rowbottom sells the cheese to places like Rosemont Market and Bakery in Portland and to the nationally famous Freedom restaurant- The Lost Kitchen. Making cheese isn't the only thing Rowbottom has had to learn with Crooked Face Creamery. As the sole owner and operator of Crooked Face she's also responsible for sales, bookkeeping, distribution, branding...the list goes on. "I like being in control of everything. But it can be frustrating trying to be good at everything, at all the pieces," she said. "I have to constantly push it." Rowbottom attributes much of her story's life force to the farmland she grew up on, and the supportive community around her. With the help of her parents, her friends and her hometown, Crooked Face Creamery is only getting bigger. "I have history here. It's where it all began. It's just so natural, I can't imagine doing it anywhere else," she said. Can't wait to try your smoked ricotta! Where in Farmington might I find it? Thanks! Yes, where can we purchase your cheese? Awesome cheese and type of business and person we want to succeed. Congrats Amy.